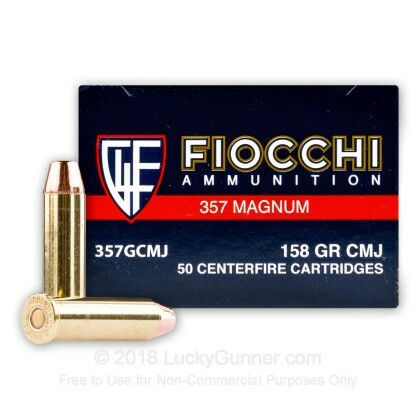 This 357 Magnum ammo is manufactured by Fiocchi, who has gained a great reputation among revolver shooters for their quality range loads at a reasonable price. This ammo features a complete metal jacket (CMJ) with a flat point. This bullet design is well suited for indoor applications with copper at the base of the bullet, which reduces lead exposure in poorly ventilated areas. This ammo perfect training ammo for any revolver or lever-action rifle chambered for 357 magnum, and it is affordable! Keep your six-shooter firing, and order some of this quality ammo today! 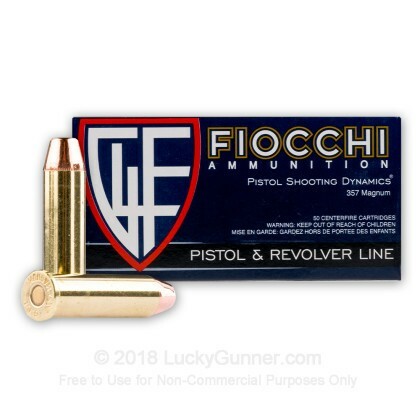 Fiocchi is an Italian ammunition manufacturer, with well over 100 years in the ammo making business. Fiocchi is becoming more and more popular with sporting shooters all over the country because of their quality products at reasonable prices. 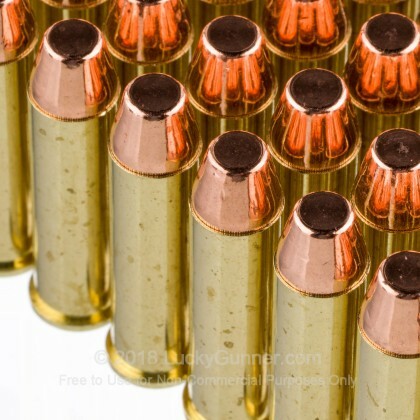 This ammo is brass-cased, boxer-primed, non-corrosive and reloadable. These rounds are awesome. They are beautiful and put together with quality and care. Performance was great, they are a solid .357 Magnum round with some good punch and very consistent. For the quality of this ammo it is much more affordable than some of the other quality brands of ammo. I have fairly new Ruger GP100 6 inch barrel, and went to the range today to put some rounds through it. I loaded 6 rounds of this ammo into the cylinder, but the cylinder wouldn't close, and the ammo got stuck in the cylinder and locked up the extractor. When I loaded 6 new rounds, the same thing happened. I was able to successfully close the cylinder with a few cartridges, but it would still fail to cycle). I bought a fresh box of magtech at the range and went through the entire box no problem (No fiocchi ammo was fired). 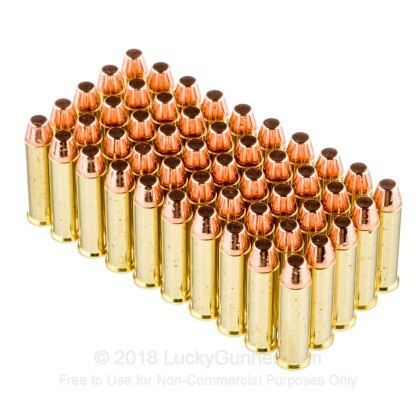 Upon further inspection and research on the internet, I found that this ammo has been known to be inconsistent when it comes to rim dimensions (too thick), which is what I suspect was the issue. My ruger was also probably being very picky, and you might not have this problem with other revolvers. Unfortunately I now have a brick of unshootable ammo sitting in my cabinet. Purchased two 50 count boxes for my new S&W 686 Pro Series. First box had 4 misfires. I haven't used 2nd box yet. I thought there might be an issue with my gun, so I purchased other ammo to see if I continued having misfires. I didn't. This ammo was unreliable for me. It shoots pretty good. Consistent patterns. Worth it! Mick. My S&W 686+ will reliably shoot just about any ammo I put in it. The Fiocchi fires pretty clean and doesn't foul my revolver or my hands and clothes. It is the least expensive option that is not reloaded or cased in something other than brass. Lucky Gunner is reliable and usually has good deals on ammo. Ammo is safely packaged for fast delivery. I usually shop around some when I am buying 500-1000 rounds of something. 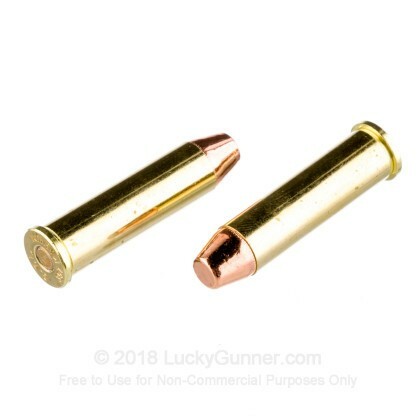 I don't usually find a better price on .357 Magnum rounds. 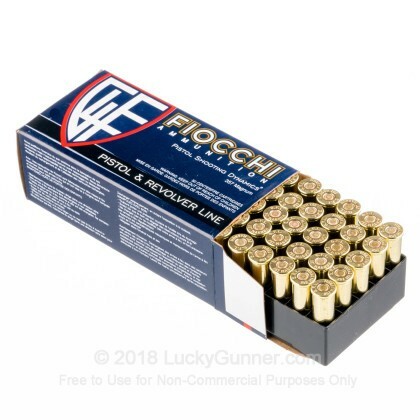 I don't shoot Fiocchi in my autoloaders because I tried it and had problems with feeding and extraction. But you don't have to worry about those things with a revolver. We also have this 357 Mag - 158 Grain CMJFP - Fiocchi - 1000 Rounds ammo in stock in a bigger quantity.